Most anyone could collect and tell a good many incidents about lost money that has been found, if he would try, but these cases came under my own observation and I can vouch for their truth. A farmer in the Kinnekinnick Valley was paid $1,000 while he was loading hay. He put it in his vest pocket, and after he had unloaded the hay he discovered that he had lost it, and no doubt had pitched the whole load into the mow on top of it. He went to work and pitched it all out, a handful at a time, upon the barn floor, and when the hired man’s fork tine came up with a $100 bill on it he knew they had struck a lead. He got it all. A man gave me two $5 bills once to pay a balance on some store teeth and asked me to bring the teeth back with me. The dentist was fifteen miles away and when I got there I found I had lost the money. That was before I had amassed much of a fortune, so I went to the tooth foundry and told the foreman that I had started with $10 to get a set of teeth for an intimate friend, but had lost the funds. He said that my intimate friend would, no doubt, have to gum it awhile. Owing to the recent shrinkage in values he was obliged to sell teeth for cash, as the goods were comparatively useless after they had been used one season. I went back over the same road the next day and found the money by the side of the road, although a hundred teams had passed by it. 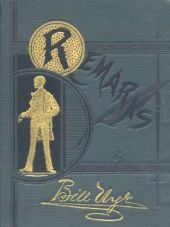 A young man, one spring, plowed a pocket-book and $30 in greenbacks under, and by a singular coincidence the next spring it was plowed out, and, though rotten clear through, was sent to the Treasury, where it was discovered that the bills were on a Michigan National Bank, whither they were sent and redeemed. I lost a roll of a hundred dollars the spring of ’82, and hunted my house and the office through, in search for it, in vain. I went over the road between the office and the house twenty times, but it was useless. I then advertised the loss of the money, giving the different denominations of the bills and stating, as was the case, that there was an elastic band around the roll when lost. The paper had not been issued more than an hour before I got my money, every dollar of it. It was in the pocket of my other vest. This should teach us, first, the value of advertising, and, secondly, the utter folly of two vests at the same time. Apropos of recent bank failures, I want to tell this one on James S. Kelley, commonly called “Black Jim.” He failed himself along in the fifties, and by a big struggle had made out to pay everybody but Lo Bartlett, to whom he was indebted in the sum of $18. He got this money, finally, and as Lo wasn’t in town, Black Jim put it in a bank, the name of which has long ago sunk into oblivion. In fact, it began the oblivion business about forty-eight hours after Jim had put his funds in there. Jim went over to the president’s room. He knocked as easy as he could, considering that his breath was coming so hard. The president opened it because it was a good door and he wanted to preserve it. Black Jim turned the key in the door and sat down. The president hesitated a moment. Then he took a roll out of his boot and paid Jim eighteen dollars. “You will not mention this on the street, of course,” said the president. When the crowd got back, however, the president had fled and he has remained fled ever since. The longer he remained away and thought it over, the more he became attached to Canada, and the more of a confirmed and incurable fugitive he became. I saw Black Jim last evening and he said he had passed through two bank failures, but had always realized on his certificates of deposit. One cashier told Jim that he was the homeliest man that ever looked through the window of a busted bank. He said Kelley looked like a man who ate bank cashiers on toast and directors raw with a slice of lemon on top.